The Chinese authorities seized more than 881 pounds of baby milk formula that had been imported from Japan because it had been produced in areas known to be heavily contaminated with radioactive material emitted by three damaged nuclear reactors at the Fukushima-Daiichi complex. 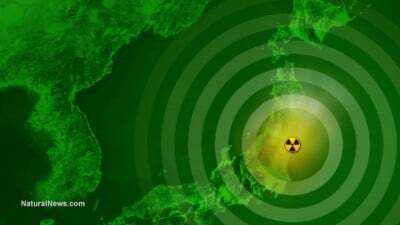 China’s Xinhua news agency reported that quarantine officials said that no excessive radioactive material was found in the formula, but the baby food was sent back to Japan because China has had a ban on any imports from the areas around Fukushima. Contrary to the clearly uninformed Meiji corporate opinion, many doctors and scientists warn that even the slightest internal radioactive contamination can cause cancer. Dr. John Goffman, Dr. Rosalie Bertell, Dr. Alice Stewart, Dr. Ernest Sternglass, Dr. Jay Gould, Dr. Helen Caldicott, and others, have all promoted the precautionary principle regarding any inhalation or ingestion of radioactive materials. Scientific evidence indicates that the exposure to radiation suffered by fetuses, infants and children is far more serious than if the same exposure is suffered by adults. Also, the damage done to girls and women by radiation – compared to boys and men – is known to be more severe. The World Health Organization’s 2011 assessment of Fukushima notes that when children are exposed to radiation below the age of five, there is a 70 percent higher risk of cancer for girls than there is for boys. Feeding radiation-tainted food to the most vulnerable is questionable at best and criminal at worst. When it comes to babies ingesting contaminated baby formula, no level is actually safe and this is known throughout scientific circles. The principle radioactive poison that is being tested for in Japanese foods is cesium-137. Unfortunately, there are also other deadly poisons that have been spewed in lesser amounts by Fukushima disaster. These include americium-241, plutonium-236, uranium-238, thorium-232 and the extremely dangerous isotope, strontium-90. All of these contaminants may also be found in food from Japan, including in baby formula. In July 2011, Tokyo officials discovered cesium-137 at levels 6.4 times the national limit in beef sold to restaurants and stores in at least five prefectures; in April 2011, radioactive iodine-131 was found in breast milk of mothers east of Tokyo; radioactive tea from Japan was seized in France in July 2011 when it was found with twice the permitted amount of cesium – not that even a trace can be called harmless. The tea had come from Shizuoka Prefecture, 300 miles south of Fukushima.